ARLINGTON, Virginia, Dec. 7 /Christian Newswire/ -- The murder rampage this week at the Westroads Mall in Omaha, Nebraska underscores the truth underlying the message on a Christmas card sent last week to a number of recipients, right to self defense advocate John M. Snyder of Telum Associates, LL.C. said here today. 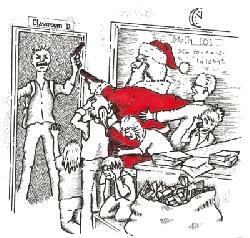 The card depicts an armed Santa Claus defending school children from a crazed gunman. "The murder of eight people and the wounding of an additional five by a suicidal madman occurred in a so-called 'gun free zone,' the insanity of which should be evident to anyone with common sense," said Snyder. "These zones just make it impossible for law-abiding citizens to defend themselves and others from armed crazies. In Nebraska, citizens with state-issued permits to carry concealed firearms can be prohibited by property owners from carrying their guns into stores, and this is just what happened earlier this week in Omaha." At the Westroads Mall, posted signs inform people they cannot legally carry guns on the property. Snyder sent the armed Santa Claus cards to the President, U.S. Supreme Court justices, members of Congress and other public officials. This custom designed card shows Santa brandishing a semiautomatic handgun as he protects frightened school children from a crazed gunman about to enter their classroom. Into our classrooms, we contend! Snyder distributed the Christmas message "to highlight the importance of having a law-abiding armed citizenry as a deterrent to violent crime and to underscore the insanity of so-called 'gun free zones.' The only freedom provided by these gun-free zones is freedom for criminals to prey upon innocent people who can't legally defend themselves. "This truth received tragic verification in April 2007 when a madman murdered over 30 people at Virginia Tech University. The university allowed the killing spree to occur when it prohibited those with state-issued permits to carry concealed firearms (CCW) from carrying firearms on campus for self defense. The Virginia State Legislature, by failing to abrogate Virginia Tech's gun-free zone policy, also unwittingly enabled the tragic massacre. Supposedly responsible educational and government officials have followed similarly absurd gun-free zone policies at other schools." Snyder added that "legislators should eliminate public funding of schools that prohibit CCW permit holders from carrying firearms. After all, when law-abiding armed individuals are able to act, as happened at Appalachian Law School five years ago, they can prevent murderous activity from escalating into a massacre." Snyder noted that, "both the Virginia Tech and Appalachian Law School incidents occurred in Virginia. In both situations, the killers were crazed students. At Virginia Tech, there were 32 victims. At Appalachian Law School, there were two victims. Why? Because Virginia Tech lobbied the Virginia Assembly to prohibit legally-licensed students and faculty from carrying handguns on campus for self defense, while at Appalachian Law School two legally armed law students subdued a crazed gunman." "This Christmas," states the card, "let's present our young citizens with the gift of safety in the schools. Allow individuals who have state-issued concealed firearm carry permits to bring their handguns onto school grounds. Prevent massacres. For the sake of self-defense, abolish gun-free zones! Best wishes for a Merry Christmas and a Happy New Year." A former NRA magazine editor, Snyder is Manager of Telum Associates, LL.C., and Public Affairs Director of the Citizens Committee for the Right to Keep and Bear Arms.